The Official Blog of ChronicleMe.com | Anonymity. Positivity. Community. The truth is that there is no single right or wrong way to talk to a friend who you believe may have an eating disorder. You just need to be prepared to be supportive and find the approach that works the best in their specific situation. This is rarely an easy thing to do, and many people are hesitant to say anything for fear that they may have read the signs wrong or that if they say the wrong thing they might offend or alienate the person they’re trying to help. It may be hard, but their health has to take priority over an uncomfortable situation. There is also every chance that your friends know they have a disorder, and they’re struggling to find a way to break the cycle. Some of them may be desperate to talk about it with someone but don’t know how to approach the subject because of their own self-conscious thoughts. And yes, it is always possible that they may respond to your attempts with anger or denial, but you can’t let that stop you either. Eating disorders cause a lot of physical and emotional damage, so no matter how delicate the subject may seem, you shouldn’t let that stop you from voicing your legitimate concerns. Be honest and caring. Be a role model, and learn as much about the situation as you can so you will know the difference between the facts and the myths about weight, nutrition and eating disorders. Then you’ll be ready to give them the support they need. It can be difficult to know for certain whether your friend really has an eating disorder or is just exhibiting some similar behaviors that are related to something else. You may tell yourself that they’re just hitting a diet really hard this month, or that they’re just acting a little extra self-conscious. You, your friends, and family can use this questionnaire to help decide if they have an eating disorder. When you’re ready to approach the subject, remember this one thing: it’s about communication, not confrontation. Don’t try and be the therapist, but don’t let your discomfort or fear of upsetting them prevent you from having the necessary conversations. Speak to them in private and explain your concerns. Be positive, calm, respectful, and firm. If your friend becomes angry or defensive, you don’t want to get drawn into arguments and all the frustrations that includes. If they deny the problem, you don’t want to get into a “do not do so” circular argument. You need to understand that you can’t ever force someone to change. They have to make their own decisions and you need to approach them as someone who will be there for them as they come to the realization that they need help. If they are willing to talk about their fears, don’t just deny it and try to convince them that they’re fine. Use this opportunity to look closer at their fears and what they think losing weight will change and why they think it will change. Just remember that one of the most crucial parts of “talking about it” is, in fact, not talking at all. You need to take the time to listen to everything they say so you can really understand their concerns and fears. Even their excuses – listen to them, but don’t be manipulated by them. You can offer help and support, but always encourage your friends to seek real eating disorder treatment. Until they’re willing to take that step, it’s unlikely they’ll be willing to make the change on their own. More than that, the longer they go without help or treatment, the more problems an eating disorder can cause for the body, and the more difficult it will be to overcome it later. Urge them to see a professional who can make the proper diagnosis and find any medical problems that could be tied to the eating disorder. There are no quick fixes here. One doesn’t just “get over it.” It’s going to take time, and that time may not be on your timetable, but stick with it and help them get through these difficult times. For more information about Eating Disorders contact us today by clicking here. Let’s be honest: the internet is a risky place. Just like offline, there are nefarious folks lurking around just looking for an opportunity to prey on others. Whether it be for monetary gain or just for their own amusement, scammers and hackers take a particular liking to whoever makes their job easy by leaving their computer open to cyberattacks. That’s why, even if you do nothing else to protect yourself online, you should at the very least install security software. You probably already have an anti-virus program installed, which works well for protecting you from some things, but it can’t do everything. Anti-virus programs mainly protect you from viruses, but it won’t do much if a hacker decides to access your computer while you’re connected to public Wi-Fi. To secure your connection, a VPN (Virtual Private Network) is your best option. When you connect to a VPN, your internet connection becomes encrypted and your IP address hidden, allowing you to browse the web anonymously. VPNs are remote servers that act as a secure tunnel through which you route your internet traffic, and they do a great job at adding an extra layer of security to your online sessions. There are many to choose from, so I’d recommend that you check out this VPN review to find the best one for your needs. Security software can’t do all the work, so you’ll also need to do a few things on your end. Without strong passwords, your accounts are more likely to become compromised. A strong password will be at least eight characters long and include numbers, as well as uppercase and lowercase letters. Another password tip: never use the same one across multiple accounts and change them regularly. With social media sites being so popular, it’s easy to share too much info, but it’s best to avoid giving out personal details to those you meet online. Don’t share your passwords, address, banking information, and other details that could be used to identify yourself with anyone you meet on the internet, even if it seems harmless at the time. Websites aren’t always legitimate, and some that may seem fine really aren’t. Stick to the ones you know if possible in order to prevent any issues from occurring. For some additional security tips, check out this guide. This blog post is brought to you by Cassie Phillips, creator of awesome content at Secure Thoughts! At the Word of Mouth Marketing Association’s Summit in 2010, Steve Knox, then CEO of P&G’s in-house word of mouth marketing agency, Tremor, gave a compelling talk entitled “Why People Talk.” Knox found that consumers talk when we give them an element of surprise that does not fit inside their existing expectations about the brand. What motivates us to share is closely related to what motivates us to talk. However, there are some key differences, nuances and amplifications that should be made. UM’s Wave, an annual global tracker of social media trends, specifically probes why people share content via social media. Essentially, sharing content on social media has rapidly become a short-hand form of communication. Whatever we share with others directly reflects on us, the sharer. What we share – from online articles to video clips – is the basis of our social currency. If you agree with the insight “it is easier to appreciate art than it is to create it,” then it naturally follows that it is easier to share content than it is to create it. 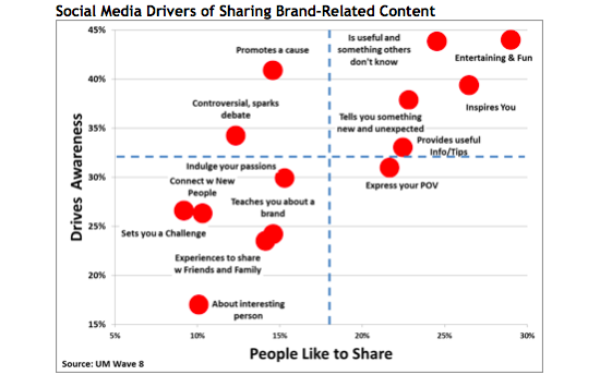 Wave shows that when Americans share content, we are happy when someone comments, or re-shares it with others we know. Conversely, we are peeved when people ignore it completely or, worse, they unfollow or block us. As Oscar Wilde put it: “There is only one thing worse than being talked about, and that is not being talked about.” Clearly, what was true about human nature in 1890 is just as true in 2015, regardless of our advances in communications technology. In this world of sharing, bloggers have boomed in importance. Wave indicates that consumer trust in bloggers (including video bloggers) has risen from 26 percent two years ago to 37 percent today. As a result, YouTube influencers have mushroomed in importance. Only six years ago, Gary Vaynerchuck led the charge as a YouTube influencer with his energetic Wine Library TV which wittily reviewed wines in a very down to earth way, inspiring his thought leadership book, Crush It. Today, YouTube influencers such as Michelle Phan and Captain Sparklez are so successful that their scale has made them ‘YouTube millionaires.’ My own personal favorite, who is less well known in the States, is Zoella. Zoella emanates a disarmingly honest demeanor in her how-to videos, with an onscreen candor which reflects the vitality Vaynerchuck championed back in the late 2000s. The best drivers of sharing are in the top right-hand quadrant which is highest for prompting both sharing and awareness. As we might expect, entertaining & fun is a lead prime driver, but also very close is what inspires you and being useful and something others don’t know or tells you something new and unexpected. The elements of something others don’t know and something new and unexpected align with what Steve Knox explored in his talk to word of mouth marketers. All the findings in this area clearly indicate the higher we can inspire a consumer’s emotions, the greater the chance of boosting their brand-related shares. Increasingly, brands are stepping into this area since it is where the greatest consumer response can be tapped. For example, several women’s brands have advocated what it really means for women to be empowered, not only Unilever’s Dove and P&G’s Always but also Under Armor – attracting mass media attention along the way. This particular branch of empowering viral videos reflects the “inspiring” element seen in the Wave map. This story was brought to you by www.ChronicleMe.com, the positive social network. Sign up today for free! Please help us thank Millie for writing a guest blog post by leaving a comment, sharing, or like! Enjoy. You want to know a secret? You have all the answers to your life. You can sit in silence and speak to your higher self asking for guidance. I get folks calling, texting, and emailing me for answers to what is already fully available in them. I am not giving them anything they don’t already know. Sometimes people just want permission from another to go through a change. At other times the crude reality of difficult decisions is too much to handle alone. BUT…but…YOU hold all the answers to your present situation. You get to mold your future. We go to counselors, therapists, fortune tellers, religious leaders, gurus, and any one out there with a spec of hope. We give another person the right to tell us what we need to do. We give them our power while diminishing our own guidance. YOU HOLD THE SECRET TO YOUR LIFE. No one else can tell you what needs to happen. We do want confirmation. We do want to know that we are acknowledged and understood. We do want to know that we are not alone on this journey. This is the best part of a support system, but ultimately YOU HOLD THE POWER to your story. If you continue listening to others’ opinions you might be directed in the wrong path. Listen to your gut. Pay attention to your intuition. If it feels wrong…IT IS! If it feels great follow that. You don’t need me or anyone else telling you what to do. I am here to listen when I can. I am here to allow you to go through the process of figuring things out…but DO NOT expect answers that you know deep within. I will not tell you what you should do because it isn’t my business to do so. I can give you suggestions, examples of how I’ve lived through similar events, but you can’t hold me responsible for your decision making. I don’t know anything but my own guidance for me. YOU HOLD THE KEY to everything in your life. Use that key to find the right lock and discover your authentic power. You got this! Millie Mestril has her own blog called Moments with Millie. “When we think of gay history in the United States, we tend to think Larry Kramer and the AIDS crisis; we think Harvey Milk; we think the Stonewall riots; we think of the decades-long fight for marriage equality. Gay men — particularly white, cis, affluent gay men — have long since been the popular face of gay rights, and consequently, theirs are the faces most often immortalized in the amorphous archives of LGBT history. Where did all the lesbians go? We’ve been here all along — even if our hallmark struggles and achievements have been white-washed, pink-washed, and dude-washed in the narrative of queer history. Even Stonewall, a crucial turning point in 1969 for the queer rights movement, is often misremembered — popular culture likes to forget the riots were incited by trans women of color like Marsha P. Johnson and Sylvia Rivera. 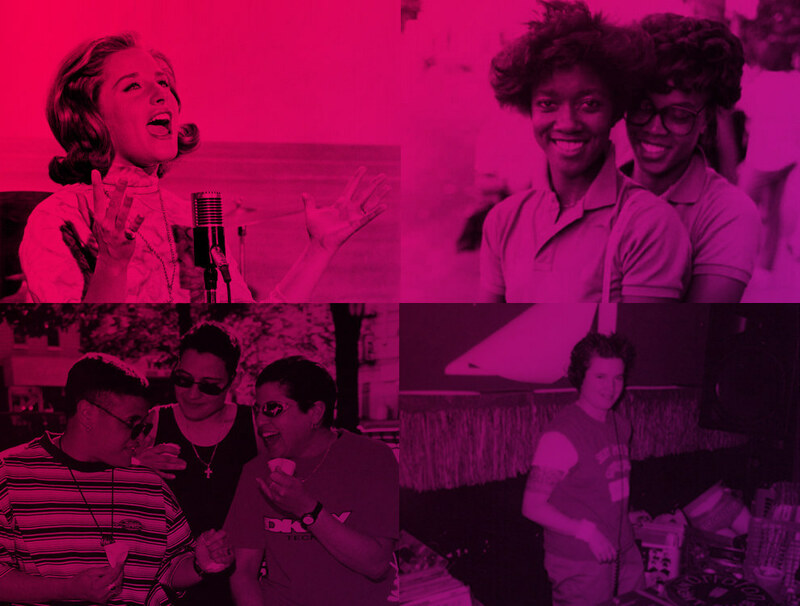 Welcome to BuzzFeed LGBT’s Lesbian History Week. In light of the historic SCOTUS decision in favor of marriage equality, we thought it was time to spend a bit of time looking behind us as we figure out what — in terms of the things left to fight for, in terms of preserving/reimagining queer lady culture – lies ahead. We’re kicking off with a retrospective of influential lesbian magazine Curve in celebration of its 25th anniversary – a glimpse at the past quarter century of lesbian culture as told in print. Throughout this week, check back in for daily pieces about the impact of very different kinds of lesbian icons, like Audre Lorde and Lesley Gore; throwback photo essays of vintage queers living and loving in a time very different, and yet not not so different, from ours; and the last lesbian bar in San Francisco closing its doors, indicative of a larger trend across the country of queer spaces getting priced out and shut down. “Pick a season and this is where you might find the creative community of women changing Chicago: in the sunlit industrial space of a renovated firehouse or creative studio, surrounded by the season’s first blooms of magenta and green, snacking on hors d’oeuvres with flutes of Prosecco in hand. United by their passions, formally they are brought together by Forth Chicago, a quarterly salon designed to create space for bright ideas curated around a central theme. The samplings of women entrepreneurs come from all corners, ranging from graphic designers to strategists, Etsy shop owners and lawyers. No networking, no skills-trading, no pretense: They are gathered intimately, in groups of ten at a time, and come to meet other like-minded women, learn from each other’s wisdom, and simply talk. The three founders, Lisa Guillot, Julie Schumacher, and Kelly Allison believe there is a beautiful enough reason to simply prioritize ideas and the women behind them. And when it becomes authentically about the people, friendships are formed, community is made, and the benefits of finding business partners naturally follow. Past themes of Forth, a playful nod to the quarterly aspect of the salon that implies momentum, include dealing with change (accented with ombre flowers and food), passion projects (where everything is served “on the side” in side carts), to letting go (complete with a bundle of balloons and wish papers that disappear when lit up). A fall salon with the theme “owning your awesome” featured boastful peacock feathers and a jewel-toned, Moroccan theme. Unlike the women-specific groups created by all-male trustee boards, usually in reaction to societal pressures rather than authentically-intentioned, Forth has given women a chance to champion for themselves. “They talk a lot about how women are more prone to the impostor syndrome, and whether it’s us feeling like we can charge the rates we think we’re worth, or calling out someone who’s using language that isn’t acceptable in a meeting, knowing you have a community of women who have your back is so critical to being able to survive,” Schumacher said. The co-founders of Forth Chicago, a designer, writer, and photographer who call themselves the “three fourths,” get along almost too-harmoniously. Unlike the often-catty, love-hate Instagram competition present amongst the most glamorous lifestyle—something that Guillot admits once being incredibly envious of—they are also surprisingly supportive, down-to-earth, and full of grace. Forth Chicago started with Guillot, who heads a boutique brand design studio named Step Brightly during her daytime job (“Her spirit animal is Kate Spade,” Schumacher said of her)—during our interview, she quite literally lit up the room, aptly donning a sunflower-yellow peacoat inside a minimalist café. Back in 2012, she had been inspired by an article she read in the New York Times Style section (“Where I find all of my ideas,” she exudes) about the two men behind The Fat Radish, who biked around New York City delivering farm-to-table lunches in hopes of growing their catering service. They started off going door-to-door, but slowly grew and began catering high-end salons, New York Fashion Week, “and all these magical things kept happening to them” before expanding into a restaurant, Guillot said. It turns out, the chefs were also in relationships with well-connected women—model-actress Dree Hemingway, and a fashion editor—both of whom used their industry connections to help their partners’ business gain momentum. Two years later, Forth is thoughtfully scaling the initiative to bring together creative women through public events like workshops on speed mentoring and running an Etsy shop. It has grown to over 100 people, and between salons, the Forth community has stayed close-knit through a private Facebook group, where new friends find business partners, bridesmaids, and after-work cocktail buddies in the mix. Fittingly, Forth’s most recent spring salon in March was about planning the ‘next’ while loving the ‘now,’ which is exactly the crossroads it finds itself at. But the key to such an organic community is exactly that: organic. Guillot harps on the idea of growing responsibly and being thoughtful about the things that go into each salon, which keeps the community authentic. Forth is anything but networking in the big and corporate sense. While Forth remains active on its Twitter, sends out regular newsletters, and frequently updates itsblog with features of Forth community members, recipes from past salons, and food for thought, the analog salon experience is one of a kind in Chicago. Still, the founders know that ultimately trust within builds the community at-large. Bloggers in Bangladesh are no strangers to death threats and assassination attempts by religious fanatics/Islamic millitants. There is a hitlist that exists that contains the names of at least 84 bloggers, out of which at 9 have been murdered. Anyone who expresses a critical view of religion is exposed and under watch. Their threats are so common and frequent that they have even stopped counting them. Bangladesh is a secular country but over 90% of it’s population is Muslim. Publicly declaring that you’re an atheist is a taboo, in this part of the world. And that’s what Avijit Roy did. He started Mukto-Mona, an online portal that “promote science, rationalism, secularism, freethinking, human rights, religious tolerance, and harmony”. Roy was murdered on his way home from a book fair in Dhaka in an attack that left his wife, Rafida Ahmed Bonna, badly injured. There hasn’t been a single person charged over these murders even though relatives have filed criminal cases stating that they were killed by “extremist fanatic groups”. 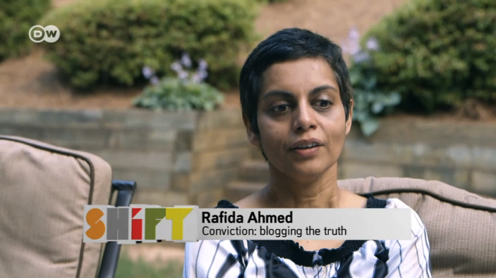 But Rashida Ahmed has not let the attacks scare her off; she remains defiant. After graduating from University of Georgia, young Brandon Stanton joined Chicago Board of Trade where he traded stocks for 3 years. After things took a bad turn, he lost his job and moved to the city of New York to do what he does best: photography. During the summer of 2000, he decided to start Humans of New York, a social media venture and photoblog, where he could showcase all the random strangers’ portraits he took on the streets of New York. After just a few months into his new hobby, his little project of photographing 10,000 New Yorkers evolved as he started to have conversations with his subjects and decided to include a phrase or a quote along with the portrait. With his vibrant pictures of quirky characters, and insightful and witty captions, Humans of New York became a real success real fast. He went on to become #1 New York Times best selling author after publishing Humans of New York in 2013 and later published Little Humans in 2014. But Brandon Stanton is not the type to enrich in the popularity he was gaining all for himself. In 2012, DKNY approached him to use 300 of his photos for a fashion campaign but he declined. When DKNY went ahead and used his pictures anyway, in at least one store in Bangkok, he decided against suing them for money that he rightly deserved. Instead, Brandon publicly asked that they donate $100,000 in his name to a YMCA, so they could send a bunch of underprivileged kids to summer camp. He appeals to all his fans to donate money for various fund-raising campaigns. From relief funds for Hurricane Sandy victims to helping a couple adopt an orphan from Ethiopia, Humans of New York’s admirers were quick to help (within 12 hours and 90 minutes, respectively, to be accurate). Another initiative he set up to raise $100,000 to send 6th graders of a public school on a trip to Harvard University was met within 45 minutes. 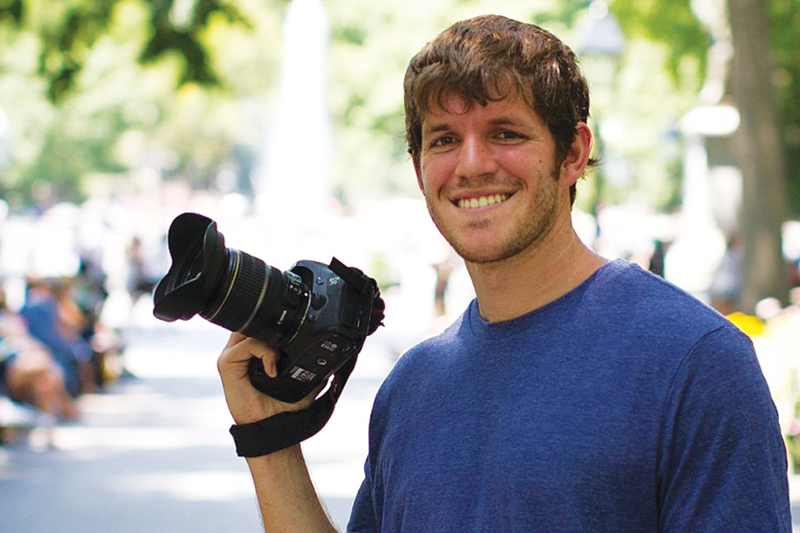 Brandon Stanton is an epitome of proof that social media gives every single user a voice. ChronicleMe is a social media interface that provides its users with a positive platform where they can voice their opinions and not worry about negative lash backs. Clearly, there are plenty of Internet users out there who are willing to provide help to those who need it, as we have learnt from the Humans of New York supporters. And ChronicleMe’s main aim is to provide users with an environment where they can feel safe, comfortable and secure, in order to seek help or find support from other users. Most people mistakenly believe that bullying/cyberbullying is a problem faced by young adolescents. What they do not know is that studies have shown that 40% of high-schoolers, who have either been bullies or victims or bullying acts, maintain this role even through college. According to a few research studies, cyberbullying amongst college populations ranges from 10% to 27.8%. Through a study by University of Washington, where 285 female students (from 4 different colleges) were questioned, researchers found that college-age females were just as likely to suffer the negative effects of cyberbullying as younger adolescents. Moreover, the study found that it could affect girls this age even worse as they are three times more likely to meet the clinical criteria for depression. If the bullying was a form of sexual abuse, the odds of depression doubled. According to Brian Van Brunt, President of the National Behavioral Intervention Team Association, first year college students and those in the Greek system experience more cases of bullying or “hazing” than other groups. With the advent of social media and anonymous apps, the cases of cyber bullying in the recent past, is at an all time high. We all know that the psychological effects of cyberbullying causes more emotional damage than traditional bullying because of the wider audience and impact of the Internet. Considering the fact that Internet is a basic necessity for almost all college students, and coupled with the fact that college is generally a high-stress environment, the effects of cyber bullying are multiplied, as are the total number of victims. The University of Washington study has shown that even cyber bullying perpetrators suffer from depression and are more likely to resort to alcohol and substance abuse. In terms of alcohol abuse, bullies suffer much more than victims. However, there is an upside: most college campuses have counseling offices and victims can easily talk to a counselor in their college clinic. Also, since college campuses provide so many diverse opportunities, Van Brunt is of the opinion that victims have a bigger chance to find a niche somewhere on campus rather than becoming isolated. 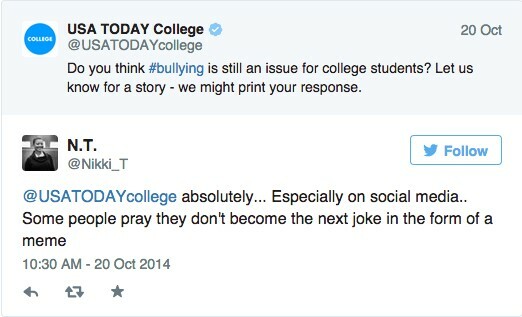 Cyber bullying at college clearly cannot be taken lightly as it poses huge problem for a lot of young adults. We, at ChronicleMe, aim to create more awareness about its effects in the hope that bullies will understand the weight of their words and victims will find courage in the fact that they are not alone. Hyderabad (India) is a crowded but beautiful city. It has a wonderful, well-preserved history: from the rich heritage of the Nizams of Hyderabad to ancient ruins of forts. Despite this, Hyderabad is one of the largest IT hubs on a global level. It also has the best food you can find in the world. Where are you attending school? Right now, I am enrolled as a full time grad student at Syracuse University. I graduated high school from Hyderabad Public School or HPS, as we call it. HPS was the home for many notable alumni like Satya Nadella (the current CEO of Microsoft) and many political dignitaries and also sportsmen like Harsha Bhogle. 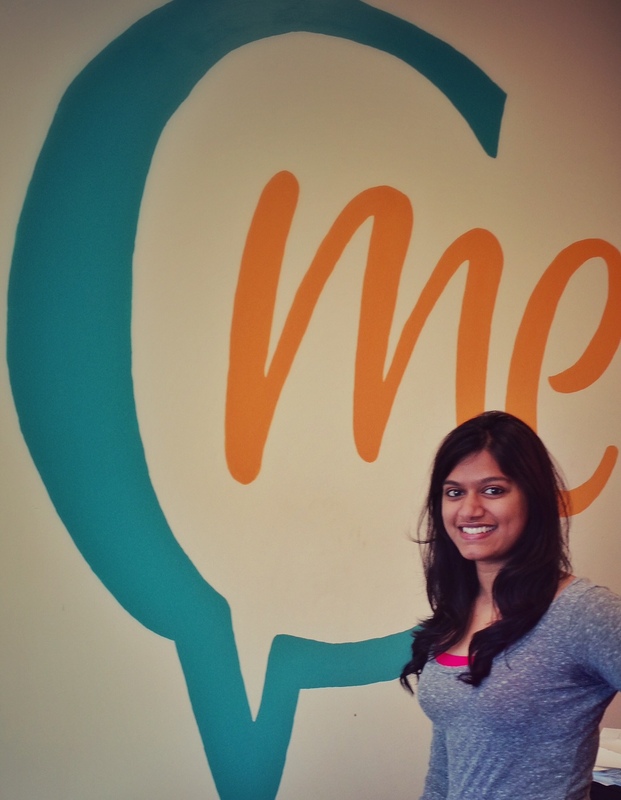 Why did you apply to work at ChronicleMe? I have always liked the idea of anonymity on the Internet because it encourages people to post the raw truth and be completely honest. ChronicleMe offers just that and more: it lets users share their stories in a completely judgment-free, safe environment while finding comfort in and supporting each other. It’s a great opportunity to be working with the team that has accomplished this. I am a huge fan of TV shows. I once binge watched 3 entire seasons of Breaking Bad in less than 48 hours. Best two days of my life. What do you like most about living in Upstate NY? To be honest, I have not seen a lot of Upstate NY (yes, I need to get out more). But Syracuse is beautiful during fall. I experienced my first winter (real winter, not the pseudo winters we have in Hyderabad where the temperature hardly goes below 70 degrees) in Syracuse and I have loved every freezing minute of it. Syracuse also has some pretty amazing food places like Alto Cinco, Recess and LoFo. What is your least favorite thing about living in Upstate NY? That I haven’t seen all of it? Haha, honestly though, I have no complaints. Except that it rains a little too much. What interests you about the Tech Garden? Working at start-ups has always been something that I wanted to do. Tech Garden houses a bunch of offices for start-ups. I have only recently started working here but the atmosphere is electric. I am excited about meeting and working with people who are passionate about what they do and also about the Germinator initiative. Hyderabadi Biryani, hands down (Hyderabad’s style of traditional biryani, made with rice, spices and meat). I also love New York style pizza, chicken wings (the spicier the better), and Mexican food. What tabs do you have open on your computer? Right now? I have Gmail, WordPress, SU’s Blackboard, Facebook, & Twitter. What do you want to do in 10 years for a career? 10 years is a loong time and I don’t like to plan that far ahead. I am more of a spontaneous, impulsive person. But I see a lot of opportunities in the future and hope to achieve something that I am proud of. Who is someone you look up to? There have been a lot of people who’ve influenced me but my biggest inspiration are my parents and brother. I am always looking to them for advice and support. ChronicleMe is based on three key things: Anonymity, Positivity, and Community. On our social network, you are in the drivers seat. You are always in control of when and to whom you are anonymous. For the first time in history, you are in complete control of your content. We call this the “Freedom of Anonymity”. What will you do with yours?